When I was a little girl my best friend was my grandmother. I was the first grandchild, which is always exciting for a new grandparent, but the fact that I was a girl made my grandmother ecstatic. She couldn’t wait to dress me and show me off. I don’t remember ever hearing the word ‘no’ come from her lips. She taught me all of the old nursery rhymes- hickory, dickory dock, the mouse ran up the clock, and such. She was so proud of me. I always ran to her whenever I learned new things. I loved to sing for her and she encouraged me to be a little performer whenever she was around. My aunts always joke with me about that- ‘we could never shut you up!’ Oh, they know they loved it! When my brothers came along, I’m told I went through the typical jealousness of having to share the spotlight. I can honestly say I never felt that way around my grandmother. She used to call me her ‘dolly dimple,’ and whenever my brothers would get into a squabble and fight, she’d get my attention and say, “come and sit with Gramma and you won’t get into trouble.” I was still special and I could see it every time I looked into her eyes. The bond of love between us, to this day, is the most powerful one I’ve ever experienced. I never doubted her love for me. I always found my place with her. Some of my best memories are of she and I walking around the North End of Boston, going to the outside market, and visiting St. Leonard’s church to light candles. 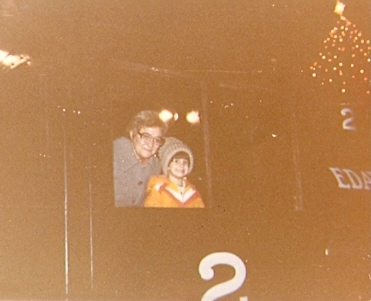 I remember she would give me a quarter to put in the little box next to the candles, all lined up next to each other. Some had actual wicks, and others had a button to press and it would light up a little light bulb inside that mimicked the flicker of a real candle. When we did this, mass was not in session and the church was quiet and aglow with the candlelight. I didn’t know how to pray the rosary, but I’d kneel down beside her in the pew and pretend to do it with her. Sometime when I was in the first grade, my grandmother got sick. Suddenly I found myself being shut out, and for the first time in my life I was being shooed away by the adults, who closed the door and told me to go play. I was confused, and I didn’t understand why I couldn’t listen and be there with everyone else. I’m sure this will sound like I’m exaggerating, but I really was a ‘good girl’ when I was young. I always did what my mother told me to do, and of course, I did everything my grandmother told me to. I accepted it, and did what I was told. Time went on and my Gramma got more and more sick. At only 8 years old, I saw a lot of things that I probably shouldn’t have, but as much as my family wanted to protect me, they couldn’t keep me away from her. She was my whole world. One day, as my mother was driving me and my brothers to my paternal grandparents’ house, I sat in the front seat wondering why we were going there, because I knew she was going to see Gramma. I looked at her and said, “Ma, I wanna come with you to see Gramma today.” Because I was well-behaved, she would sometimes let me go with her and drop off only my brothers at my other grandparents’ house. But she told me that I couldn’t go with her that day, and that she’d take me to see her tomorrow. I didn’t argue. I spent that day with my Nonni and Nonno, playing with my brothers. I can’t quite remember what happened exactly that day. The only thing I do remember is my mother coming to get us. She leaned against Nonno’s recliner as we gathered on the couch because she had something to say. I remember her telling us that Gramma went to ‘heaven.’ We all sat there crying as my mother tried to explain what that meant. I think my brothers cried more because my mother was so upset and crying herself than for any other reason. They were only 3 and 5 years old. I was mad. I felt like I’d been deceived. I realize I was only a child, but I felt insulted that no one made an effort to teach me about what was really going on, and that my grandmother wasn’t only sick, she wasn’t going to get better. Maybe it was because they couldn’t handle that thought themselves. This day changed my life forever, and I consider it the first day of the rest of my life. What followed were hectic days trying to get our affairs in order, as they say. Needless to say that after being kept from my grandmother on the day she passed made me more angry that I had known I could feel at that age. Because my Gramma had so many friends, they decided to hold the wake for two nights. I insisted on being there both days. Nobody was going to tell me I couldn’t see my Gramma again. I kissed her on the cheek, told her I loved her, and tried to accept that this was the last time I would ever see her. Note *This story is written from my direct experience. As an adult, I’ve had conversations with my mother about what happened that day. Of course, she did not think my Gramma was going to die that day, and did not intentionally keep me from her. But to really tell the story from my own point of view, these feelings are necessary to document, as they truly did embed themselves in my psyche and have affected me for most of my life, intentional or not.